Orthostatic Hypotension and Parkinson’s: could sitting up be affecting your memory? Orthostatic hypotension (OH) is among the most common non-motor symptoms in Parkinson’s disease (PD) with prevalence reported as high as 53%. Yet, accurate diagnosis and management can often elude patients, who may be sent to a variety of specialists, including cardiology for management of fluctuations in blood pressure. Both hypertension (high blood pressure) and hypotension (low blood pressure) contribute to cognitive decline, and a combination of vascular risk factors during an individual’s lifetime could accelerate functional cognitive loss later in life. According to some researchers, both elderly and younger individuals with orthostatic hypotension (OH) show relative deficits in verbal memory and sustained attention, both of which are predictors of subsequent cognitive decline that is greater than would be expected in the context of normal aging. Orthostatic hypotension, when it occurs in Parkinson’s disease, is a sign of autonomic dysregulation. A better understanding of OH by patients and professionals treating Parkinson’s patients is important as delayed treatment of fluctuating blood pressure can result in injuries from falls and also be associated with reversible cognitive decline. Symptoms of OH include lightheadedness, fatigue, neck pain, presyncope, and syncope (syncope is a temporary loss of consciousness caused by a fall in blood pressure. Q: What are symptoms that patients should report to their neurologist that might indicate a diagnosis of OH? Dr. Gil: The most common symptoms experienced by patients with orthostatic hypotension (OH) include: dizziness, lightheadedness, feeling faint or as if one is going to “pass out”. Other symptoms often reported are: weakness, fatigue, tiredness, knees buckling, blurred vision or tunnel vision, confusion, worsening of balance, and pain in the neck, shoulders and upper back (“coat hanger pain”). These symptoms typically appear upon standing and improve as patients sit down. Q: How do you examine patients in your office if you suspect OH? Dr. Gil: I must explain that OH is very common and caused by many different problems, particularly: medications! We must differentiate OH from Neurogenic Orthostatic Hypotension (NOH). The latter describe patients with neurological problems that cause a dysregulation in the patient’s ability to sustain a normal blood pressure upon standing. Going back to your question, in our practice, most patients are at risk of this problem, because of this, we check BP sitting and standing in ALL patients, regardless why they come to see us… It is very easy and DOES NOT take that much time. Q: When or what time of the day are symptoms of NOH more common? Dr. Gil: Typically first thing in the morning, as patients change positions from supine (in bed) to standing. Furthermore, midmorning becomes “the perfect storm”, as the effect of body position is combined with morning medications, many of which could worsen NOH, including antihypertensive drugs as well as the anti-Parkinson drugs (dopaminergic drugs). Furthermore, breakfast brings another factor, as the GI system “demands” more blood supply. All of these factors reduce the blood pressure and increase the symptoms previously described. A very important difference between NOH and OH, is that patients with NOH typically experience elevation of the BP when they go to bed (supine hypertension), which is NOT necessarily the case for those with OH. To minimize the supine hypertension, patients with NOH are asked to elevate the head of the bed 4 to 6 inches and in some cases, to take a short acting antihypertensive drug at bedtime. Q: Are men and women affected equally by OH? Dr. Gil: Yes. However, there are drugs that are notorious in their ability, frequency and severity in which they cause OH, and worsen NOH. I refer to Tamsulosin (Flomax), Doxazosin (Cardura) and Amlodipine (Norvasc). The first two are more often (but not exclusively) used in men because of urinary (bladder/prostate problems). Amlodipine is a very popular and widely prescribed antihypertensive drug. It is very effective reducing the BP, and as a common side effect, it causes swelling in the legs, for which the patients are often prescribe diuretics which further worsen the NOH. Q: Do you routinely screen patients with NOH for cognitive problems and/or refer patients for neuropsychological testing? 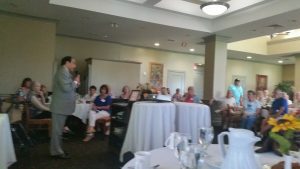 Dr. Gil: According to several studies, the frequency of NOH in patients with PD ranges from 20 to 50%. So it is important that even the primary care physician check BP sitting and standing routinely, particularly in high risk patients. Because it is known that NOH worsens cognition and could potentially aggravate or cause dementia, we do often test patient’s cognitive status with simple screening tools such as (MMSE or Folstein Test, MOCA (Montreal Cognitive Assessment) as well as a formal and comprehensive neuropsychological evaluation, performed by highly qualified and trained neuropsychologists. 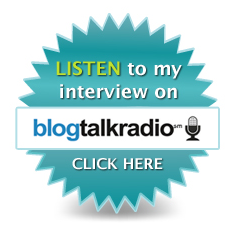 Q: What medications are available and how can they help? Dr. Gil: The first and only FDA approved drug for the treatment of NOH is Droxidopa (Northera). However, two other drugs are often used: Midodrine (Proamatine) and Fludrocortisone (Florinef). The first two drugs work causing peripheral vasoconstriction which increases the resistance to the heart pumping mechanisms and increase the BP, and Fludrocortisone is a hormone that basically retains water and expands the intravascular volume and with this, increases the BP. It is, however, CRITICAL, for physicians to review all the medications that a patient is taking and eliminate or reduce the doses of those than can worsen this serious condition, often associated with worsening of balance, falls, injuries/fractures, hospitalizations, worsening of cognitive status, and even cardiovascular and cerebrovascular events (angina, heart attacks, TIA’s and strokes). 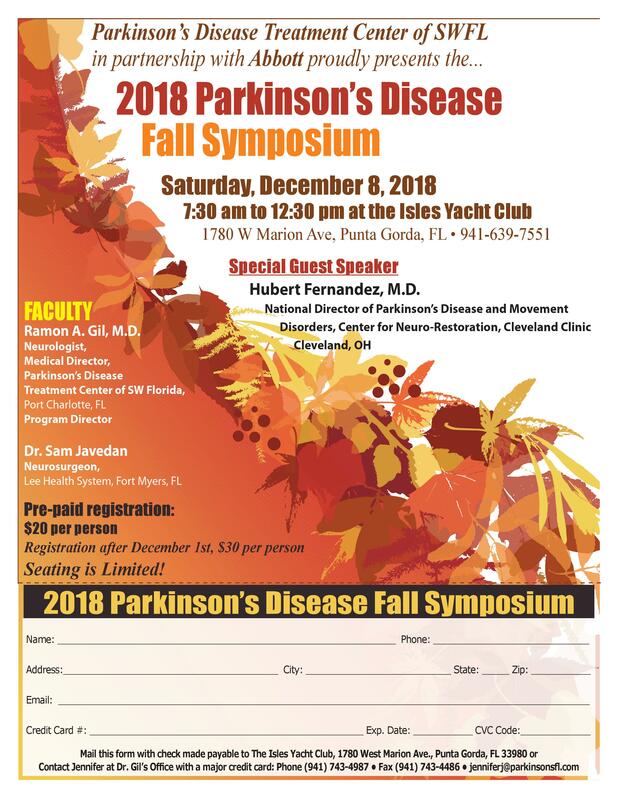 If you would like to learn more about latest treatments and medications for Parkinson’s disease, join Dr Gil, and Guest speaker, Hubert Fernandez, MD, at the 2018 Parkinson’s disease Fall Symposium to be held in Punta Gorda, Fl. 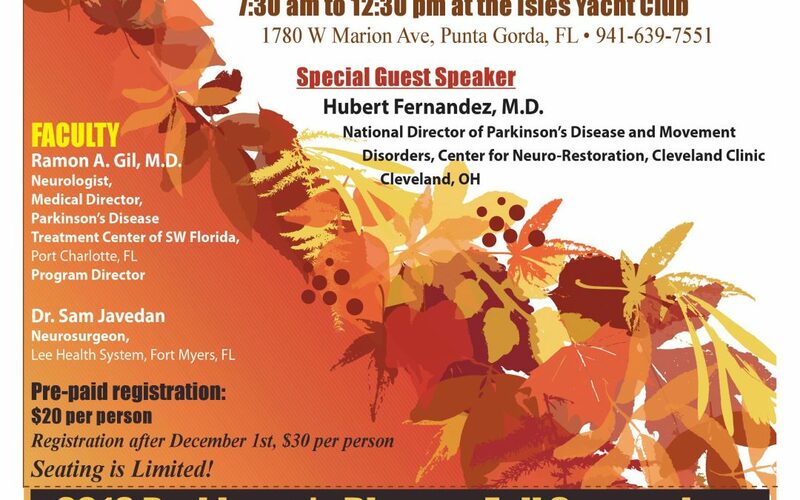 Dr. Fernandez is the Director of the Parkinson’s disease and Movement Disorders, Center for Neurorestoration, Cleveland Clinic, Cleveland, Ohio.